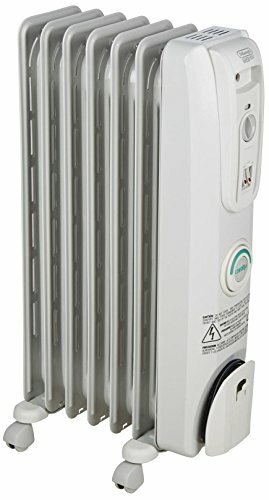 How Much Heat Can An Oil-filled Heater Give Off? When purchasing a space heater for use in your house during winter, one of the most popular options in the market is the oil-filled radiator. Thanks to their effectiveness, energy efficiency, and safety, oil-filled radiant heaters are more desirable than other options such as water heaters or bar heaters. But what makes them so effective and convenient? Let’s take a look at how they work and what models are considered the best. Find out more as you read one! Oil heaters consist of metal columns with cavities. Inside the body and fin of the heater is diathermic oil, which flows freely around the heater. The oil is not used as fuel, but instead serves as a heat reservoir, so it never gets used up. It just continues circulating through the heater for as long as you use it. When it is plugged in, electricity is consumed by a resistor inside the heater to generate heat. That heat is absorbed by the diathermic oil that is enclosed in the heater. As the oil in the heater warms up, it begins to circulate through the fins and columns. As the oil is slow to lose heat, the unit only switches on occasionally to keep the liquid at the right temperature. Some basic models have high, medium and low settings, but others offer timers and precise thermostat temperature controls. 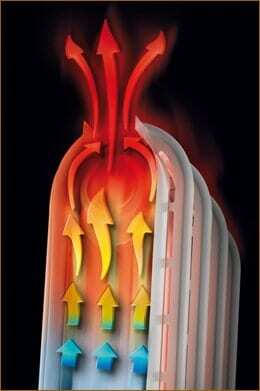 As the oil moves, it transfers heat into the metal of the heater’s fins, creating an even surface temperature. One of the advantages of an oil-filled heater is that they operate so silently. This is because most models don’t have built-in fans to distribute hot air. As the metal fins heat up, they begin to radiate heat into the room. This heat is circulated throughout the room by natural convection in the air. Unlike traditional radiators, oil-filled radiators are mobile and can be moved around almost everywhere. They connect to your household electricity with an ordinary wall plug, and most have carrying handles. Larger models have wheels for easy repositioning. A common concern from buyers is about the need to refill the oil. Because the oil is not burnt but is instead used as a heat reservoir, you don’t need to refill the oil. The high specific heat capacity and high boiling point of the oil means that your heater can store a lot of heat without the oil getting hot enough to boil. This makes the design of the system much simpler. Typical oil heaters range in power consumption/output from 300 to 2400 watts, and their length and number of columns is roughly proportional to their power rating. 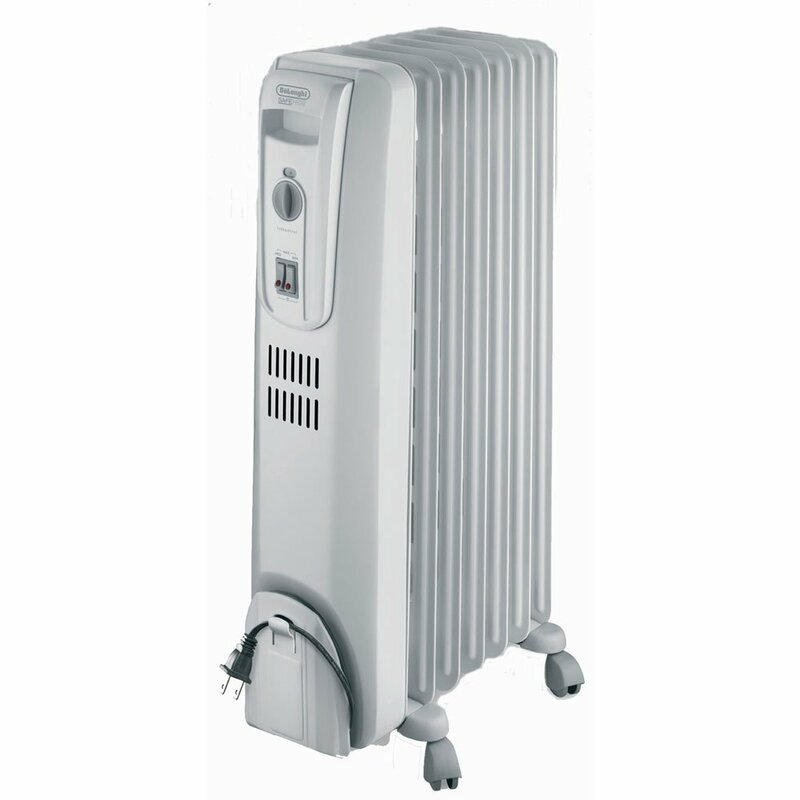 A 2400 watt oil heater is usually approximately 3.5 feet in length. Multiply the wattage of your unit by 3.41 per watt to calculate BTU. A standard 1,500-watt electric heater produces 5,115 BTU per hour. All electric resistance heaters are 100% efficient, with operating costs determined by their wattage and the length of operating time. A 500-watt heater will take twice as long to reach the same thermostat setting as a 1000 watt unit; the total consumption of electricity is the same for both. Heater sizes of 1,000 watts/3,410 BTUs are suggested for rooms under 100 square feet, a 1,500-watts/5,115 BTUs for rooms measuring 100 to 150 square feet, and a 2,500-watt/8,525 BTUs for rooms between 150 and 250 square feet. 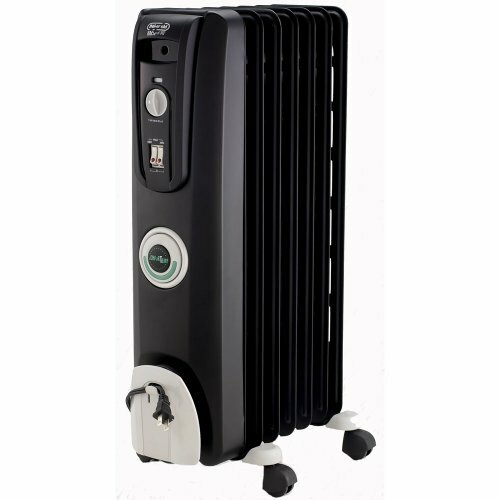 Whereas a traditional space heater with an exposed heating element uses a fan to blow hot air into the room, oil-filled heaters are almost entirely silent. The most noise it makes is some clicking as the thermostat adjusts itself. Since the heater does not use a fan, the air in your room won’t dry out. Electric heaters are almost 100% efficient, which means that all the energy used is converted directly to heat. An oil-filled heater doesn’t even have to provide power for a fan motor. Oil heaters keep radiating heat even after the power has been turned off. The lack of moving parts, besides wheels on some models, means that the heater will last a long time if well-maintained. Once the area or room reaches a comfortable temperature, oil-filled heaters will automatically cycle on and off to maintain that warmth, instead of running continuously, saving you money while preventing overheated rooms. The oil isn’t used as fuel, so there’s no need to replace it, ever. Oil-filled heaters are lightweight and easily move from place to place. 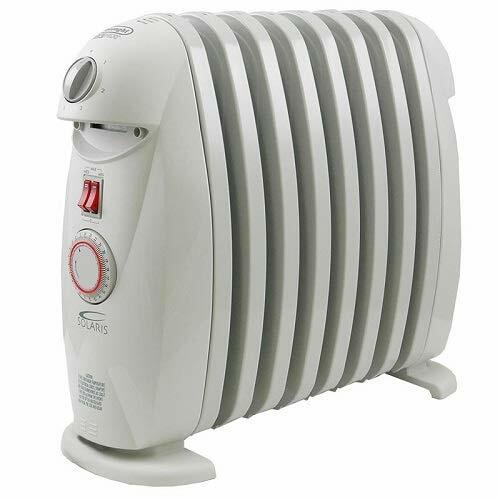 Oil-filled heaters are some of the safest space heaters available. Most models include overheat protection and tilt-switches that turn the heater off in case of a problem. The heating element is sealed inside the heater, so there’s no chance it will encounter anything flammable. The metal surfaces get warm to the touch, but never hot enough to burn if brushed against accidentally. An oil-filled heater is entirely enclosed, so there’s no need to worry about dust or debris getting inside or fingers poking through an exposed grille. Also, there’s no concern about blocking air flow through intake and outtake vents. Since they don’t burn oil or gas, they don’t produce carbon monoxide and are safe to use indoors. One of the disadvantages of oil-filled heaters is that they take a little longer to heat up than a fan-forced heater, since they have to first heat the oil, then warm the air around them. They can also leak oil if they are not well built. Some basic precautions should be observed for safely operating the heater. First, avoid having any object within three feet of an oil heater. Using an oil heater to dry clothes is not recommended by any modern manufacturer, as there is a risk of fire. Similarly, don’t keep fabric and clothes too near the heater to prevent risk of fire. It should also be noted that some oil heaters contain strong warnings to avoid operation in damp areas (such as bathrooms or laundry rooms) because the moisture and humidity can damage components of the heater itself. Now that you know how an oil-filled heater works, it’s time to check out some highly rated heaters and see whether one of them is the right one for you. This heater features the ComforTemp button that saves energy and money by automatically maintaining the optimal room temperature. The three heat-settings allow adjustable output levels, making the operation more energy-efficient. It has seven oil-filled fins which give 1500 watts of heating power and silent operation. This heater gives plenty of bang for the buck thanks to its features, including silent operation, three temperature settings, safety, and mobility. 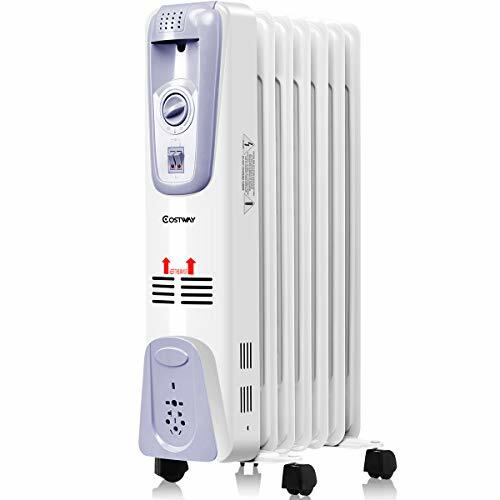 It's a good choice for bedrooms and rooms which need heating in cold weather. This excellent product from DeLonghi is safe for bathroom use, thanks to its GFI plug. The heater is designed to maximize radiant heat while ensuring a low surface temperature. There is an adjustable thermostat and variable heat settings to customize your heating needs, including a 24-hour programmable timer. With 96 settings you can heat a room for any amount of time and for different time periods during the day and night. For safety, it has a gently rounded design and thermal cut-off, and the unit never needs refilling of oil. Due to its compact size, it fits everywhere. This is a great heater for use in the bathroom, due to its GPI plug. However, keep in mind that some customers have complained of build quality issues, so factor that into your purchasing decision. 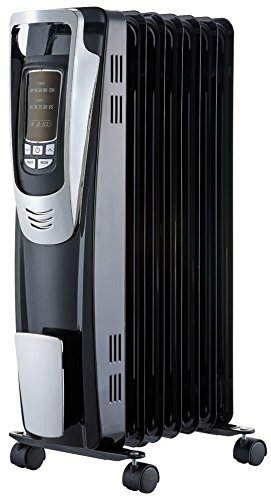 This new electric heater model has three heat-settings, (low at 600 watts, medium at 900 watts, and high at 1500 watts) and is equipped with 4.2 pounds of permanently sealed oil, meaning you’ll never have to replace it. Safety is guaranteed due to its tip-over cut off switch and overheat protection. It has four universal casters for moving it conveniently to wherever it is needed and the compact shape is ideal for storage. The cord housing design helps you store the cord easily. Thanks to its quiet operation, you’ll have no trouble falling asleep or focusing on your work. It has a power indicator light to show that the heater is still turned on. Compact, quiet, and portable, this heater is a great choice for people who need heat on a budget. However, keep in mind that some customers have complained of build quality issues, so factor that into your purchasing decision. Like the other oil filled heaters on this list, this one is also permanently sealed with pure diathermic oil for stable, efficient heating and never needs refilling. 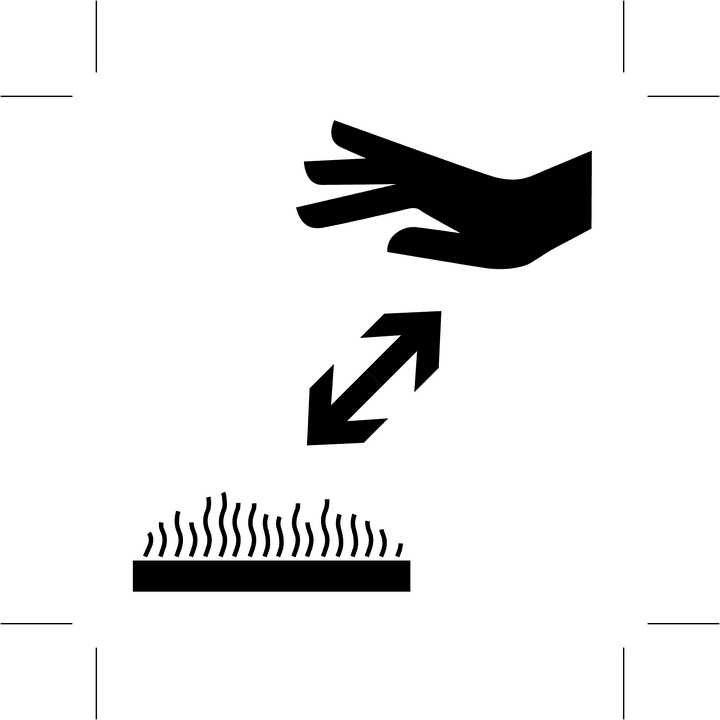 It is safe to touch due to its design, and it uses economical ComforTemp technology to save energy and money by automatically maintaining the optimal temperature in the room. It has the safety feature of thermal cut-off, which prevents overheating. For durability, the construction is rust-resistant metal with no exposed elements it has no sharp edges. The smart-snap wheels make it portable and stable. Store the cord when not using the heater by wrapping it around the heater. The power output is 1500 watts and is enough to heat up a medium or large room in colder weather. 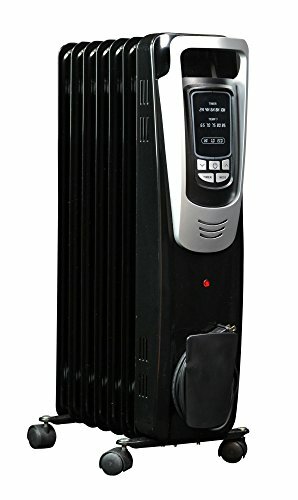 This is a great heater for warming up medium or large rooms. It is designed for maximum convenience and takes into account your needs for a comfortably warm, yet silent,room. The Dragon model is designed for large spaces like your bedroom and features easy-to-use digital controls. The 24-hour programmable timer is convenient for programming it to operate at the right time. It has three heat levels and the Eco function automatically sets the most appropriate power level for your room, helping to reduce bills. It comes with wheels that let you easily move the heater. One the downside, it has no remote control. The NewAir AH-450B is packed full of useful features that make it a popular choice. For starters, it can heat spaces up to 150 square feet, making it ideal for dorm rooms, dens and small offices. For safety, it has an overheat protection feature and a tip-over switch. It is easy to move around using its four casters and carrying handles. Other helpful features include a 10-hour timer, a remote control, three heat options and five temperature settings. 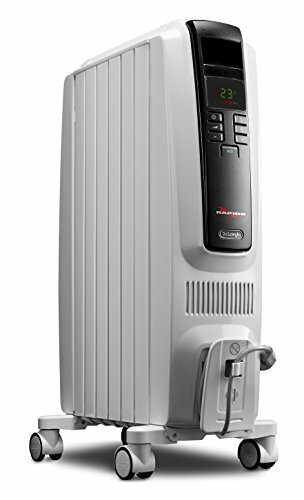 Among the best available on the market, the DeLonghi oil-filled radiator heaters are the most popular and best rated. Plus points for the TRH0715 include its simple controls that allow temperature adjustments and has three temperature settings. A thermal cutoff prevents overheating, and the heater never requires refilling. It is also energy efficient and made from durable rust-resistant metal, so it will last a long time. Anti-freeze technology automatically turns the unit on when the temperature drops below 42 degrees, preventing frozen pipes. The heater has no moving parts, providing consistent, silent warmth. The unit features snap-in wheels, requiring no tools for assembly or set-up. The cord wraps around the front plate, so moving and storing the unit is easy. Disadvantages include that it gets quite hot so people, especially small children, could burn themselves on contact with the surface. And like most oil-filled heaters it takes time to warm up a room after starting. It does not have a remote control. 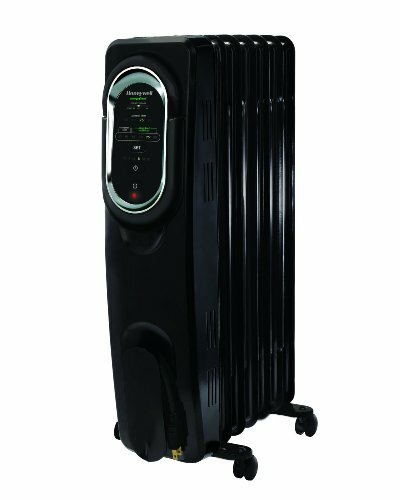 The HZ-789 heater comes with digital controls and a 12-hour timer, adjustable thermostat and three heat settings. It’s convenient for small spaces, which it heats up very fast. It has a large handle and wheels for mobility. For safety it has a tip--over switch, overheat protection, 3-prong grounded plug and a heavy duty power cord. It does not get too hot to the touch, so is generally safe for children and pets, although care should still be taken during operation. It does not have a remote control. The NY1507-14A has a digital display and comes with a remote control for adjusting the thermostat for personal comfort. Durability is assured with heavy gauge steel construction and a rust-free enamel finish. The oil never needs refilling or replacement. It has a handle and casters that make it easy to move. The cord can be wrapped convenient storage during the off season. When you need to heat up a small, enclosed space or you need a heater to supplement your existing heating in certain rooms, an oil-filled heater can be very helpful. Their robustness, ease of use and efficiency make them popular with homeowners and businesses alike, and with new features like programmable timers and remote controls, the latest models can truly make staying warm a convenience rather than a hassle.